Native North American Art 0 Edition This exciting investigation explores the indigenous arts of the US and Canada from the early pre-contact period to the present day, stressing the conceptual and iconographic continuities over five centuries and across an immensely diverse range of regions. The richness of Native American art is emphasized through discussions of basketry, wood and rock carvings, dance masks, and beadwork, alongside the contemporary vitality of paintings and installations by modern artists such as Robert Davidson, Emmi Whitehorse, and Alex Janvier. 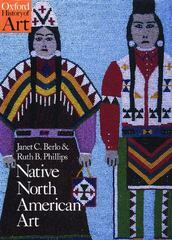 Authors Berlo and Philips fully incorporate substantive new research and scholarship, and examine such issues as gender, representation, the colonial encounter, and contemporary arts. By encompassing both the sacred and secular, political and domestic, the ceremonial and commercial, Native North American Art shows the importance of the visual arts in maintaining the integrity of spiritual, social, political, and economic systems within Native North American societies.